Vibratech TVD camshaft dampers are designed in conjunction with OEM engine development to reduce valvetrain NVH and improve timing. 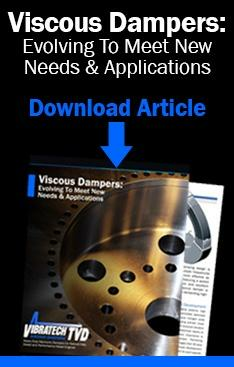 Viscous torsional dampers are available down to a five inch outer-diameter and feature a hermetically sealed housing. Flanges, gear and pulley options can be integrated into the outer housing. No damper maintenance is required and it can be designed to last the life of the engine in most applications. Built into every Vibratech TVD torsional viscous damper is expert torsional vibration analysis, design integration, engineering and demanding product validation. ISO 9001:2015 Design & Development certified. Tuned for optimum NVH reduction. Lasts the life of the engine. Suitable for large displacement, high torque diesel and gas compression engines. Major global manufacturer of agricultural and construction equipment contracted Vibratech TVD during new engine development process to design, test and manufacture a viscous style camshaft damper to reduce valvetrain NVH in high power diesel engine application.